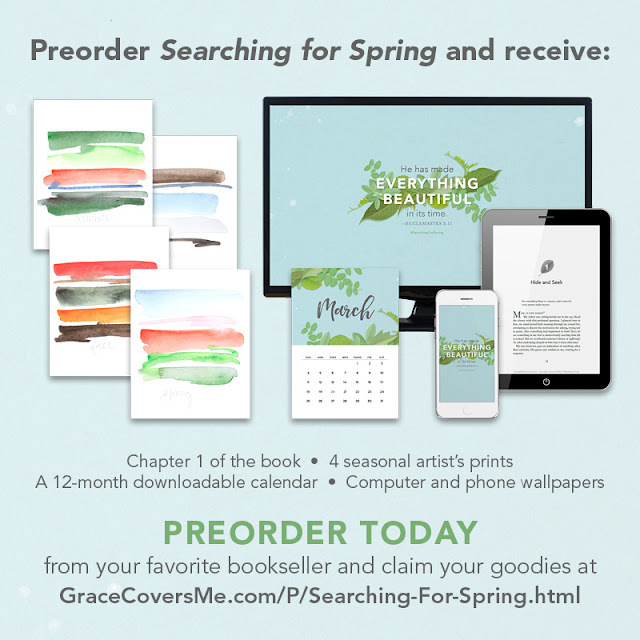 Grace Covers Me: Announcing the Preorder Treats for My New Book, "Searching For Spring"
Announcing the Preorder Treats for My New Book, "Searching For Spring"
As I told you recently, I have a new book coming out on March 6 called Searching For Spring: How God Makes All Things Beautiful in Time. This book, at its heart, is about faith. How do we, while holding the pain and brokenness that life throws at us all, live by faith, believing that God is eventually going to right all wrongs and restore all that's broken down? How do we un-numb ourselves from the mundane routines and the constant distractions in order to see God making beauty even now? And how do we ourselves join in the beauty-making God is currently doing? We start with creation. Creation says there is a God and that this God is beautiful. Scripture, too, speaks of God's beauty, most often as his glory: the infinite sum of his goodness, strength, and dazzling purity. Our lives also speak of God's beauty, because God bestows his beauty upon us: he creates us uniquely and wonderfully, and, according to Ecclesiastes 3:11, he works everything in our lives to make it beautiful in time. He is alive, and living things, as we learned in science class, reproduce. They give life. The problem is that we often seek the treasure of beauty in lifeless and decaying things. We call a new purse beautiful. We call fleeting physical attractiveness beautiful. And we call created things beautiful without turning to discover and worship the source of all beauty. Our definition of beauty can be limited, confining, and destructive to our own joy, because decaying or dead things cannot birth joy, nor can they produce beauty and life. In addition and even more to our detriment, we deem things ugly that are really in process of becoming beautiful: suffering, brokenness, confession, loneliness, and death. All of these experiences are painful, but each can produce or lead us to unexpected beauty: Perseverance. Hope. Redemption. Heaven. God himself. The question remains: Where do we seek beauty? What do we find beautiful? And where does the beauty we seek direct our minds and hearts? The secret of life is to seek beauty in God himself and embrace in faith his ability to make all things beautiful in his time. This perspective leads to our gratitude and joy, and toward imitating the creative nature of our God. Seeking true, alive beauty means we must take a big picture, slow process perspective of life. The natural seasons teach us how. Using these seasons as a framework, Searching For Spring is an invitation to a treasure hunt for beauty in both familiar places and unexpected places. It's an invitation to awaken your affections for the Creator of it all and a call to go and rest in the sovereign hands of God. Searching For Spring is for the man or woman who is waiting for something in their life to become beautiful, whether brokenness and suffering or faithfulness that hasn't yet borne fruit. I want to show you not only how to wait on God's beauty to bloom but also to see that there is beauty even in the waiting. Your preorder purchase of Searching For Spring comes with preorder treats! The first chapter of the book will pop in your inbox for immediate reading (and perhaps for deciding if it's a book you'd like to share or discuss with your friends). My artist friend April Sanders (aprilsandersart.com) has created four exclusive abstract prints representing each season, which you'll receive as a download. Enjoy a downloadable yearly calendar that will remind you to take in the literal and figurative beauty of each season of your life. Download computer and phone wallpaper of the book's theme verse, Ecclesiastes 3:11. 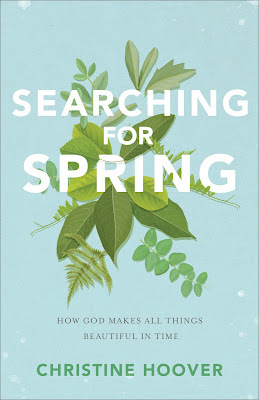 Searching For Spring is available for preorder on Amazon, Barnes & Noble, Target, or Christianbook.com. Once you've preordered your copy (paperback, ebook, or audiobook), simply fill out this form and you'll immediately receive an email with your gifts.